Penguin Publishing Group, 1980. Mass Market Paperback. Acceptable. Disclaimer:A readable copy. All pages are intact, and the cover is intact. Pages can include considerable notes-in pen or highlighter-but the notes cannot obscure the text. At ThriftBooks, our motto is: Read More, Spend Less.Dust jacket quality is not guaranteed. Signet. Used - Very Good. Former Library book. Great condition for a used book! Minimal wear. 1980-09-04. Good. Ships with Tracking Number! INTERNATIONAL WORLDWIDE Shipping available. May not contain Access Codes or Supplements. May be ex-library. Shipping & Handling by region. Buy with confidence, excellent customer service! 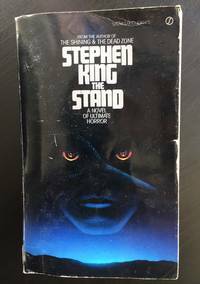 This is a first edition of the 1980 mass market paperback release of The Stand. Released 11 years prior to the uncut version of The Stand and, it remains difficult to find a first edition of this signet with the cut version. Perfect for Stephen King collectors and those looking to read the original version.